background: Bernie Marsden (ex-Whitesnake) put together an All-Star Line-Up for a day of live music to benefit Cancer Research UK and The National Kidney Research Fund back in 2004 and Zak was one of the participants. A second PITP was held in 2005 (this time without Zak). Now after a long gap, Bernie is throwing the third PITP, As per the official site, this time the focus of their cancer and kidney disease fundraising will be on care and support by benefiting Macmillan Cancer Support, Florence Nightingale House and Oxford Kidney Unit. 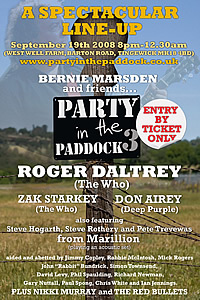 The event was scheduled to run 8 pm - 12:30 am, and tickets cost £60 each, and must be ordered through the website - www.partyinthepaddock.co.uk. Besides the live music, your entry includes Pig Roast of veggie option, dessert and drinks. - Bernie's Official Site & Online Shop!